TRADITIONS 24% BEEF TUB is formulated to be fed on a free-choice basis to beef cows and heifers while they are grazing pastures with adequate forage or are receiving silage, hay or green-chop. Consumption of the TRADITIONS 24% BEEF TUB should range from 1.0-2.0 pounds per head per day where free-choice roughage is available. If consistently high consumption of TRADITIONS 24% BEEF TUB is experienced, your feeding program should be examined (see Important Consumption Data, below). It is important that your cattle have been on a high quality Southern States free-choice mineral for at least one week prior to the introduction of the TRADITIONS 24% BEEF TUB. It is also important that your cattle have been receiving adequate forage from grazing, hay or green-chop prior to the introduction of the TRADITIONS 24% BEEF TUB. Cattle that are cleaning up fields that were planted in soybean or other edible beans should not be fed TRADITIONS 24% BEEF TUB. Raw beans usually contain high urease enzyme activity which can cause urea to break down. Do not feed TRADITIONS 24% BEEF TUB in conjunction with other NPN containing feeds. Once the TRADITIONS 24% BEEF TUB has been introduced to your herd, you should maintain a fresh supply for your cattle at all times. Supply (1) 200 lb. 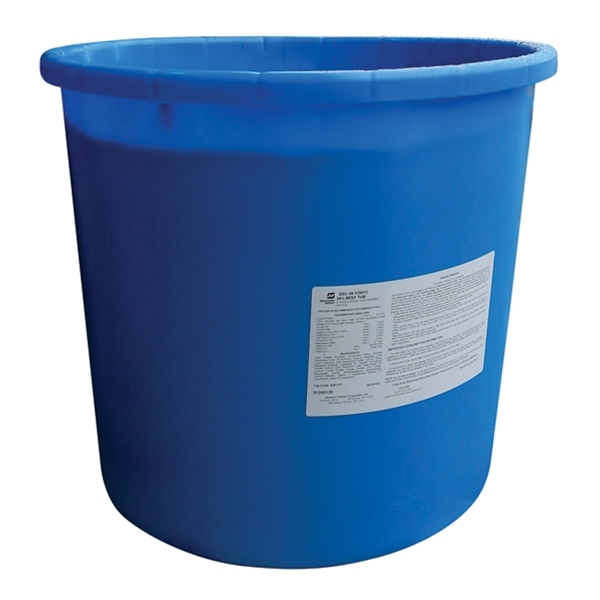 (90.72 kg) tub for every 10 to 13 head of cattle or (1) 125 lb. (56.8 kg) for every 5 to 8 head of cattle. Feed TRADITIONS 24% BEEF TUB near water source or near areas where cattle loaf. On range or in large pastures, make TRADITIONS 24% BEEF TUB available in more than one location. If your cattle run out of TRADITIONS 24% BEEF TUBS, observe them closely for 3 days after restocking with tubs in order to prevent over-consumption. The TRADITIONS 24% BEEF TUB is free-choice; therefore, consumption will vary depending on the quality and/or quantity of forage available to the animals, the condition of the cattle, previous feeding programs, type of mineral program being used and their feeding location. Cattle may need to adapt to the TRADITIONS 24% BEEF TUB before the correct consumption is reached. If consumption is low, good forage quality and feeding location may be the reason. If consumption is higher than desired, the quality and/or quantity of forage may need to be increased. If the forage is adequate, you may want to consider placing the tubs further away from loafing or watering areas and, at the same time, reducing the number of tubs available to the cattle. NOTE: Do not feed to sheep. Do not permit intake of supplemental selenium to exceed 0.3 ppm in the total ration. Beef cattle can be fed 3 mg/head/day of supplemental selenium from feed supplements for limit feeding. Free from Restricted Ruminant Protein Products per Title 21, CFR 589.2000/2001. CAUTION: Store in dry area. Observe and follow label directions. TO OPEN – Remove Top Cardboard TRADITIONS 24% BEEF TUB is formulated to be fed on a free-choice basis to beef cows and heifers while they are grazing pastures with adequate forage or are receiving silage, hay or green-chop. Consumption of the TRADITIONS 24% BEEF TUB should range from 1.0-2.0 pounds per head per day where free-choice roughage is available. If consistently high consumption of TRADITIONS 24% BEEF TUB is experienced, your feeding program should be examined (see Important Consumption Data, below). It is important that your cattle have been on a high quality Southern States free-choice mineral for at least one week prior to the introduction of the TRADITIONS 24% BEEF TUB. It is also important that your cattle have been receiving adequate forage from grazing, hay or green-chop prior to the introduction of the TRADITIONS 24% BEEF TUB. IMPORTANT CONSUMPTION INFORMATION: The TRADITIONS 24% BEEF TUB is free-choice; therefore, consumption will vary depending on the quality and/or quantity of forage available to the animals, the condition of the cattle, previous feeding programs, type of mineral program being used and their feeding location. Cattle may need to adapt to the TRADITIONS 24% BEEF TUB before the correct consumption is reached. If consumption is low, good forage quality and feeding location may be the reason. If consumption is higher than desired, the quality and/or quantity of forage may need to be increased. If the forage is adequate, you may want to consider placing the tubs further away from loafing or watering areas and, at the same time, reducing the number of tubs available to the cattle. NOTE: Do not feed to sheep. Do not permit intake of supplemental selenium to exceed 0.3 ppm in the total ration. Beef cattle can be fed 3 mg/head/day of supplemental selenium from feed supplements for limit feeding. Free from Restricted Ruminant Protein Products per Title 21, CFR 589.2000/2001. CAUTION: Store in dry area. Observe and follow label directions.